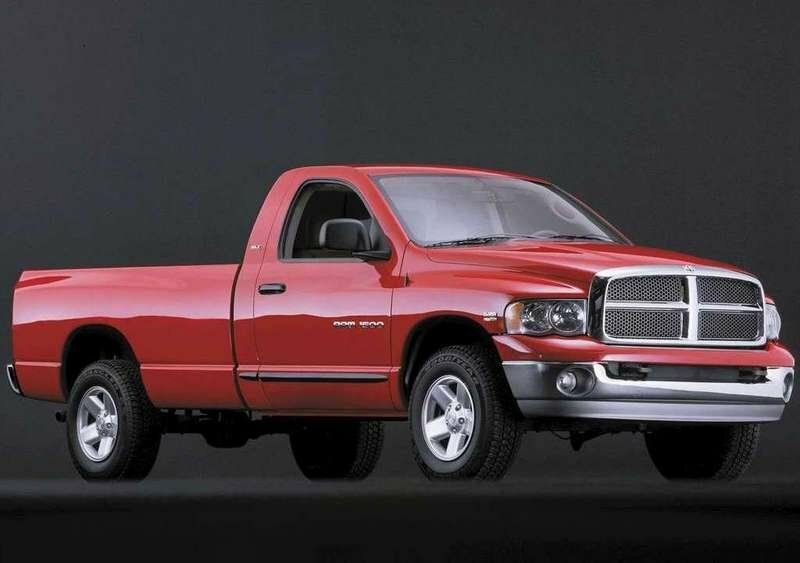 The previous generation Dodge Ram was a big success for the company and Dodge didn’t risk to made radical exterior changes for the 2002 model. Hence most of the upgrades were made under the skin. The newer generation may look very close to its predecessor, but it comes with radically improved driving dynamics and technologies which helped the Ram stay in front of the pack. This major update included an all new frame, suspension, powertrains and interiors. 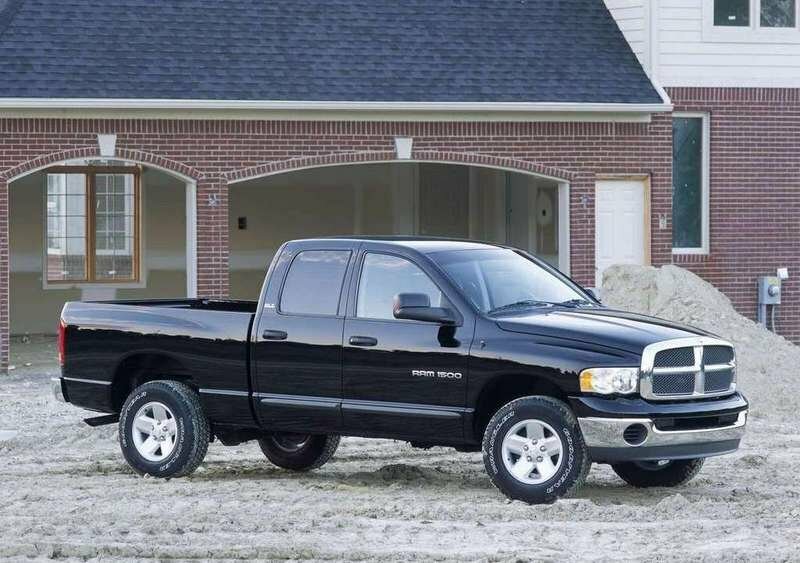 The third-generation Dodge Ram 1500 came with a choice of 3.7 liter V6, 4.7 liter V8 and 5.9 liter V8 engines. 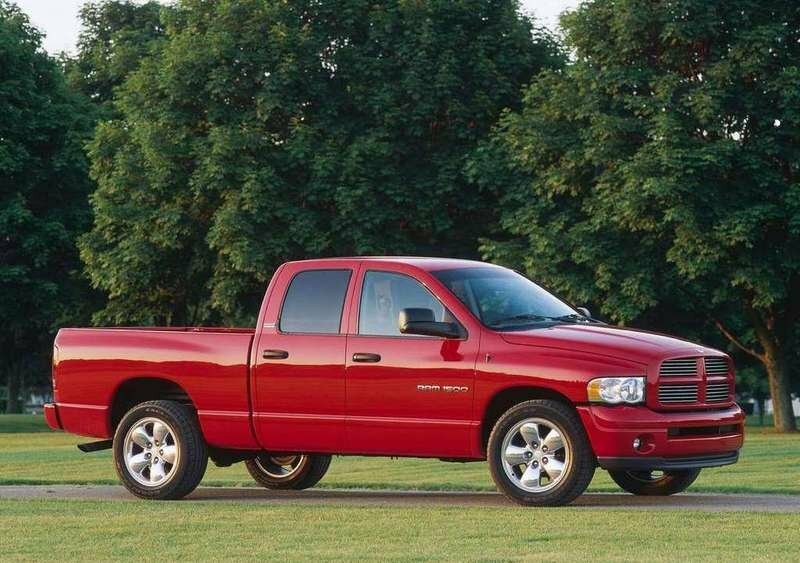 The redesigned Ram trucks revamped Dodge’s sales with 400,000 units sold in 2002 and nearly 450,000 sold in 2003. Dodge wanted to build the third generation on the success of the previous one and decided to play it safe in terms of exterior design. The new Ram drew inspiration from the old one and came with more pronounced styling details which gave it a modern look and a boost of aggressivity. The most obvious exterior change is the front grill which is larger and more pronounced. The headlights were also redesigned and now have a more attractive style which gives the truck a touch of dynamism. The hood was also slightly more aggressive, while the front bumper has been modified as well. The third generation Dodge Ram also offered the biggest standard wheel and tire combination on a light-duty full-size pickup with 17 inch wheels for the 2WD ST version and 20 inch wheels for the SLT Sport models. The Dodge Ram 1500 was available in two cab styles namely Regular and Quad, two bed lengths - 6.3 feet and 8 feet - and three trim levels - base ST, mid-level SLT, luxury SLT Plus. While the exterior modifications were pretty small, the interior was completely redesigned. The dashboard design was now pretty attractive following the trends of its time and we also like the overall ergonomy which is certainly a clear evolution over the previous model. The driver is met by a clean instrument cluster fitted with six white faced gauges and other useful indicators to keep you posted on various vehicle stats. Thanks to its intuitive layout, the instrument panel is fairly easy to read during both night and day trips. The center stack came with a classical layout, being fitted with the audio system on top and the HVAC controls at the bottom. The center console is flanked by two air vents ant it’s fitted with a few cubby holes and storage compartments were you can keep various things. The seats are big and comfortable, and offer adequate back and side support. For its time, the Ram’s steering wheel was among the most ergonomic units in its class offering a great grab and a modern design. Moreover it was also available with integrated controls and a few convenient adjustments. Dodge decided to limit the bed length with 3 inches and added them to the passenger compartment. In this way the Ram Quad Cab has the expansive passenger room of a crew cab, while keeping the truck’s overall length nearly as the previous model’s Quad Cab. Access to the rear seats can be made fairly easy thanks to the conventional doors which open up nearly 90 degrees. 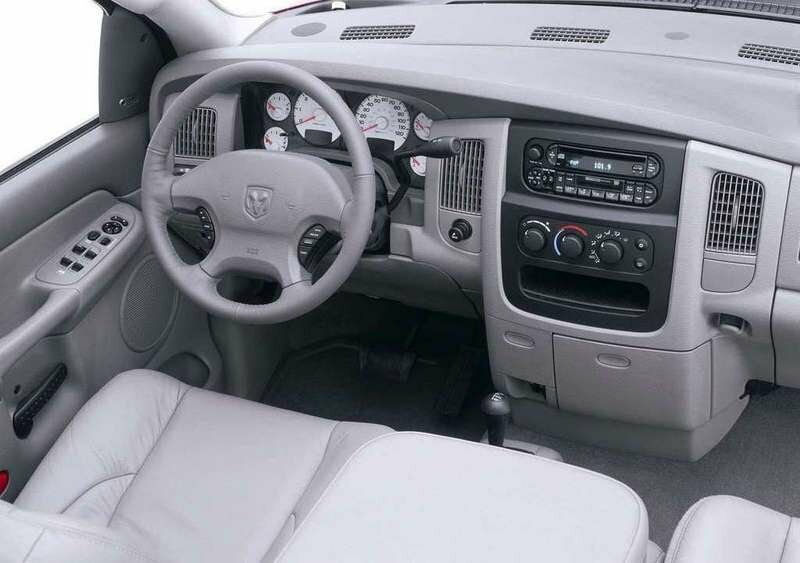 The basic Ram 1500 ST is equipped with air conditioning, AM/FM/cassette stereo, a 40/20/40-split front seat and a fold-down center armrest. The SLT model adds cruise control, cloth seating, overhead console with trip computer and power windows, locks and mirrors. The top of the line SLT plus comes with leather seating, heated driver and passenger seats, power driver seat, HomeLink transmitter system, a 240-watt 11-speaker sound system (with a CD player and steering wheel-mounted controls) and keyless entry. The entry level engine was a 3.7 liter V6 which developed 215 hp and 235 lb-ft. The second engine option was borrowed from the Jeep Grand Cherokee and had a 4.7 liter displacement with a V8 configuration, developing a maximum output of 235 hp with a peak torque of 295 lb.ft. The V6 unit could’ve been ordered only for the 2WD Regular Cabs, while the 4.7 liter V8 was standard for the rest of the models. The third generation Ram 1500 was also available with the old 5.9 liter V8 engine which cranks out 245 hp and 335 lb-ft. Unfortunately this dinosaur was heavily dated and came with poor performances and high fuel consumption for a modern V8. The smaller engines come with standard five speed manual gearboxes with a four speed automatic available as an option (standard for the V8). The maximum towing capacity for the Regular Cab is rated at 8,860 pounds, and 8350 pounds for the Quad Cab, while payload capacity is 2,530 and 1,770 pounds, respectively. The third generation Dodge Ram 1500 was equipped with fully boxed side frame rails which is better suited for the utilitarian character of the truck as it eliminates rattle and offers a more rigid platform. All these features are translated into better handling abilities and a good body balance. All 2002 Ram 1500s come with independent front suspension and four-wheel disc brakes, while the top of the range SLT comes with ABS for all four wheels. The suspension is pretty rigid, but the steering is accurate and offers a good balance between lightness and road feedback. 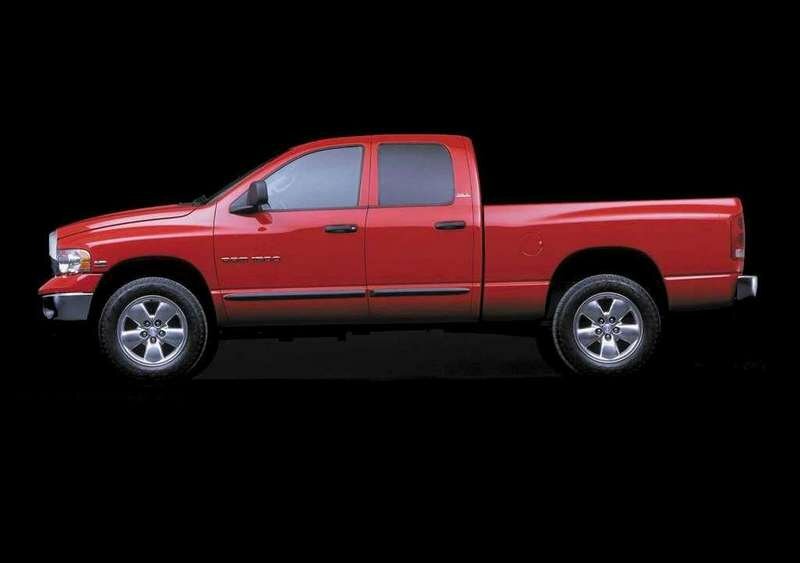 Dodge has done a good job with its third generation Ram 1500 as it kept all the positive attributes of the previous model and also added a lot of upgrades, improving the payload capacity, handling and comfort. The vehicle had a pretty nice exterior design and we also like the interior as it’s pretty comfortable and spacious.